Come and taste our delicious home baked pies Saturday and Sunday, 10am-5pm. 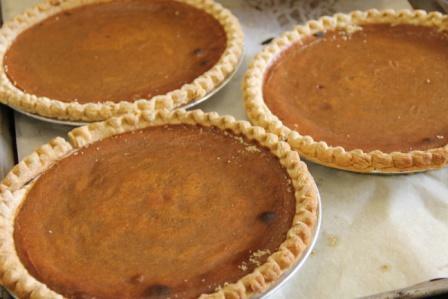 Not sure which of our over 25 varieties of pies to serve for your Thanksgiving meal? Come out to try something new or taste your favorite. Our friendly store staff will be on hand to take your Thanksgiving pie orders. Join Terhune Orchards in providing meals and support for HomeFront during this holiday season. Terhune Orchards donates 200 pies for Thanksgiving to food pantries. Help in our food drive by bringing canned goods for HomeFront. Enjoy a delicious pie tasting for $3 per person. All proceeds from this event will be given to HomeFront to help those in need. Tasting takes place in our Wine Barn. Wine tastings will be available.